Glastonbury isn't taking any risks this year. Instead it's relying on three headline acts that have a history of delivering every time. Coldplay, Adele and Muse will get the crowd jumping, dancing and singing even if it ends up snowing. Tame Impala, Two Door Cinema Club and Bastille are just some of the acts lower down the bill that want to satisfy their fans by playing what they expect and perhaps something to keep them on their toes. The festival is over four decades old and has come a long way from an attendance of 12,000 and being free to having over 135,000 people last year. The tickets have become something sacred over the years. If you're not lucky enough to be there in the flesh, coverage of the acts stretches around the globe. Glastonbury weather - be prepared! It's become tradition for people to post the pictures of their muddy experience in the field of Glastonbury. This year is looking WET. And in a day and age where pictures are always being posted on social media, people can get caught up wanting to look good rather than wearing something practical. I don't know about you, but I'd rather be dry and warm than look fashionable. So check out our guide to the best hiking bootsand best waterproof jackets.We don't recommend wellies for Glasto as after five days walking miles in them you pretty mucb won't be able to walk anymore. We've also got a guide to camping gear and best tents, too. The BBC is the place to see all your favourite acts from the Pyramid Stage, Other Stage, West Holts, Park Stage, John Peel Stage and the BBC Introducing Stage. The BBC Glastonbury site will stream all the coverage to your laptop or mobile devices wherever you are so you never miss a thing. You'll also be able to catch up on anything you've missed up to the 26th July either on the BBC Glastonbury site or on iPlayer. The BBC Music App promises to deliver a personalised experience for Glastonbury this year. You'll find your favourite acts here and be able to listen to all the highlights of the day if you've missed them. It's worth the download to make your commute home that bit easier. The BBC airwaves will also be playing host to over 50 hours of Glastonbury content across BBC Radio 1, BBC Radio 1Xtra, BBC Radio 2 and BBC 6 Music. You'll be able to catch up on each station's coverage by visiting the site for each. Worthy FM is another great choice for radio coverage during the festival, it's been the on-site radio station for Glastonbury since 2007 and is run by volunteers. Worthy will also be putting out a podcast which will feature discussions and interviews with top performers. EE is the tech sponsor for Glastonbury 2016 and is once again pulling out all the stops to make sure the people at the festival have coverage and battery life to share their experiences. The company predicts the 135,000 festival goers will use over 15 terabytes of data over the course of the four days. The network has erected dedicated base stations to make sure you're never without internet. Moreover there will also be charging stations at the EE tent. But there's always a queue and you wouldn't want to miss out on your favourite band because you were waiting in line to charge your phone now would you? 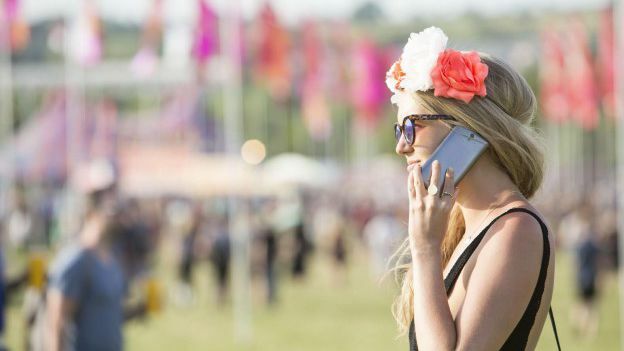 So bring a mobile charger - check out our guide to the best festival tech! Better still, take a spare or old phone that doesn't need charging every 10 minutes. @GlastoFest on Twitter and Instagram and @glastonburyofficial on Facebook. Here you'll find the latest updates on the festival, including notices for those attending, as well as awesome pictures of all the action. @bbcglasto is a good alternative to the official Glastonbury Twitter account, giving you another source of commentary and live updates. @emilyeavis is the daughter of Michael Eavis, the founder of the Glastonbury Festival, she also provides updates on what's going on at the festival. @GlastoWatch is your unofficial source for rumours and gossip on the latest acts as well as line-up information.